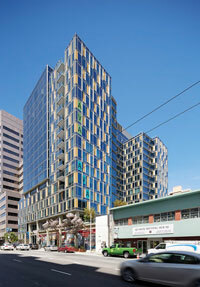 Domestic hot water system for a newly built, 17-story, 273-unit apartment building, located near downtown San Francisco. Usages: showers, faucets, clothes washers. The building recently achieved LEED Gold status. How to provide sufficient amounts of hot water at the right temperature for a multi-family development of this magnitude, whose round-the-clock demand for hot water varies widely by the hour. 18 Noritz NCC1991-DV Condensing gas-fired tankless water heaters, hung and piped together in a custom-fabricated, Unistrut rack system located in a mechanical room on the rooftop of the AVA 55 Ninth. To meet peak demand, the 18 water heaters can deliver a combined maximum of 3,598,200 BTU/hour, with a maximum flow rate of 104.6 gallons of 120°F per minute. But the 18-unit system has a turndown ratio of 225 to 1, meaning that a single NCC1991 responding to the opening of a single hot-water outlet could use as little as 16,000 Btu per hour, while generating a flow rate of only a half-gallon per minute. The innovation goes beyond the water heaters themselves. A solar hydrothermal system preheats incoming ground water before it enters the AVA 55 Ninth system, raising the temperature so that the tankless water heaters need not work so hard to meet the designated set point, further saving energy. This powerful, yet highly adaptive system is designed to fully meet tenant needs for hot water without consuming any more energy than necessary. The multiple-unit strategy should also spare tenants the hassle of being without hot water even during maintenance periods. Should a unit malfunction, it would simply be removed from the rack for repairs or replacement, while the other 17 continue to work to meet the demand. “We had briefly considered storage systems, but the space savings, energy efficiency and high turndown ratio drove our decision to go tankless,” says ACCO’s Kevin Hunt, P.E. 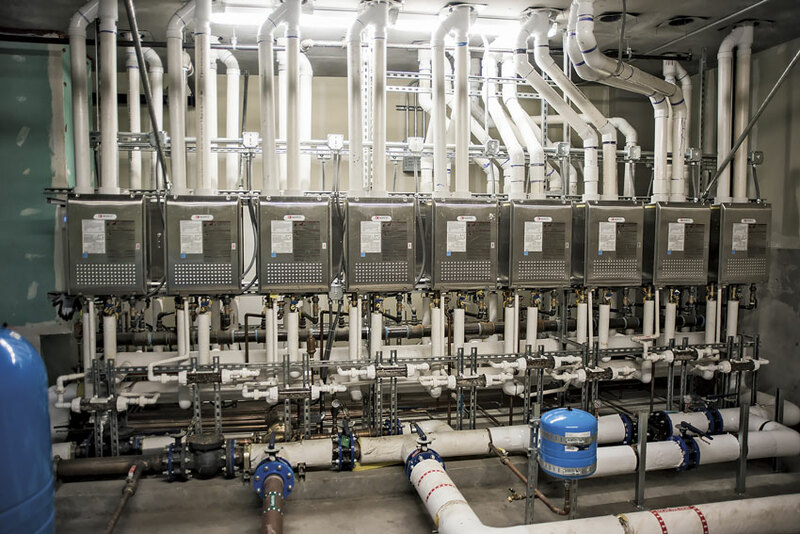 One of many sustainable features at the new AVA 55 Ninth, a 3.6 million BTU/HR DHW system meets the hot-water needs of 273-unit building with a flow rate of 104.6 gpm. 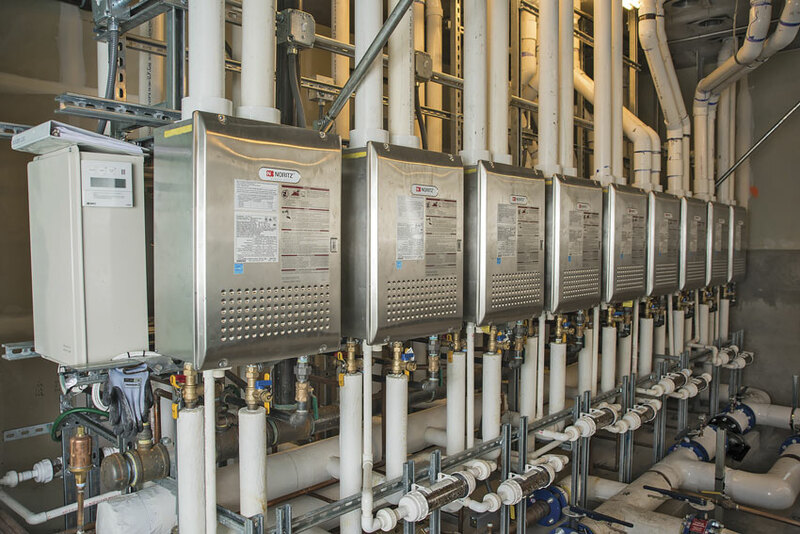 Solar hydrothermal preheating system boosts water temperature to maximize efficiency, while multiple redundant units help avoid costly shutdowns for servicing. SAN FRANCISCO (August 2015) — Tankless water heating technology has demonstrated its workability in a wide range of residential and commercial building projects over the past decade. The twin financial attractions of saving both energy and space – the units are frequently wall-hung and thus have a zero footprint – are the obvious drivers of this growth. 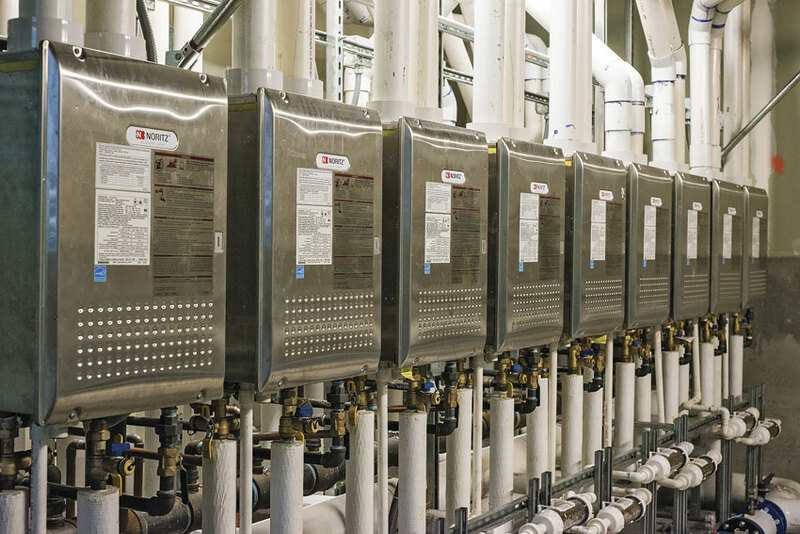 In addition, many commercial building owners and managers have found the use of multiple, redundant tankless units to be an ideal strategy for applications – hotels, restaurants, etc. – that simply cannot afford to be without hot water even for an hour or two of maintenance. But what about a large, high-rise, multifamily project with 273 apartments – studio, one- and two-bedroom units – on 16 levels, including a 3,300 square-foot fitness center, plus another 26,600 square feet on the ground floor, including 4,800 square feet of retail space? 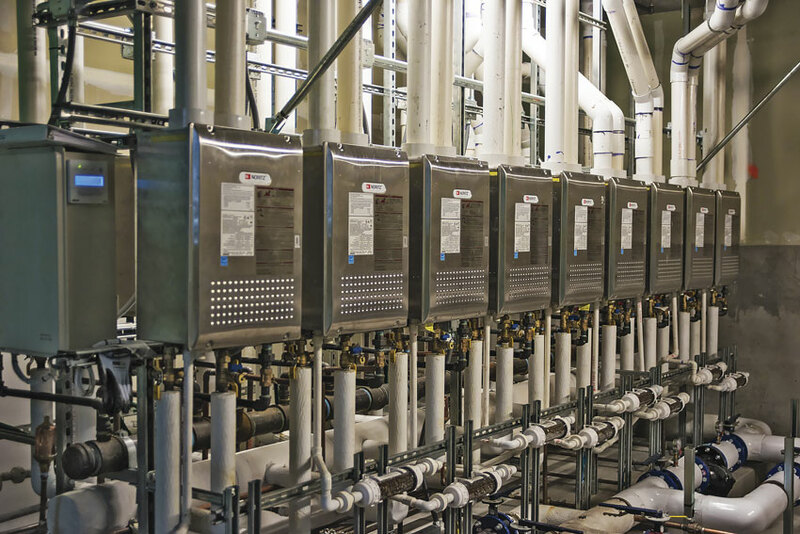 Can a tankless system meet the varying demands for hot water in a modern, urban community of this magnitude and complexity? And can it do so with a single, centrally controlled domestic hot water system, rather than each apartment having its own hot water-delivery appliance? waterless or low-flow urinals in the common areas on the ground floor. A Silver honoree (“Most Tech Savvy Community”) in the 2014 Multi-Housing News magazine’s Excellence Awards competition, AVA 55 Ninth also includes a number of informal “chill spaces” for encouraging socializing among the tenants. Besides the fitness center, the property offers an outdoor BBQ and dining area with a movie screen, a social media trending wall, a utility center to oversee resident electronics, and a 10,000-square-foot, landscaped courtyard. 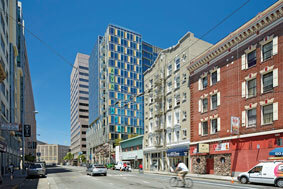 Bicycle parking stalls, a bike repair room, a pet-washing station and a dog run round out the amenities package. Less visible, but no less crucial to the quality of tenant life, the innovative domestic hot water (DHW) system combines 18 separate, gas-fired tankless water heaters – all high-efficiency, condensing models with an Energy Factor of 0.95 – into a single cohesive operation. Made by Noritz America, the NCC1991-DV units are hung and piped together in a 16-ft. x 7-ft., custom-fabricated, Unistrut rack system located in a 1,000-square-foot, “penthouse” mechanical room on the roof of the building. Direct-vented with 4-inch PVC piping through a nearby wall to the exterior, each water heater ramps its outputs up and down with the building’s changing demand for hot water throughout the day. More on how the heaters synchronize with one another in a bit. The heater package was designed and installed by ACCO Engineered Systems of San Leandro, Calif. Lead plumbing engineer Kevin Hunt did the design in 2012, assisted by a lead coordinator and two technicians who handled the installation the following year. Hunt estimates that his work, done in consultation with the manufacturer’s Design Services department, required three days, with another five devoted to 3D modeling and coordination. Rack construction, heater hookup and testing spanned roughly one week. Building owners often have the final say on the domestic hot water system, and the driver is usually the sustainability goals of that same owner. 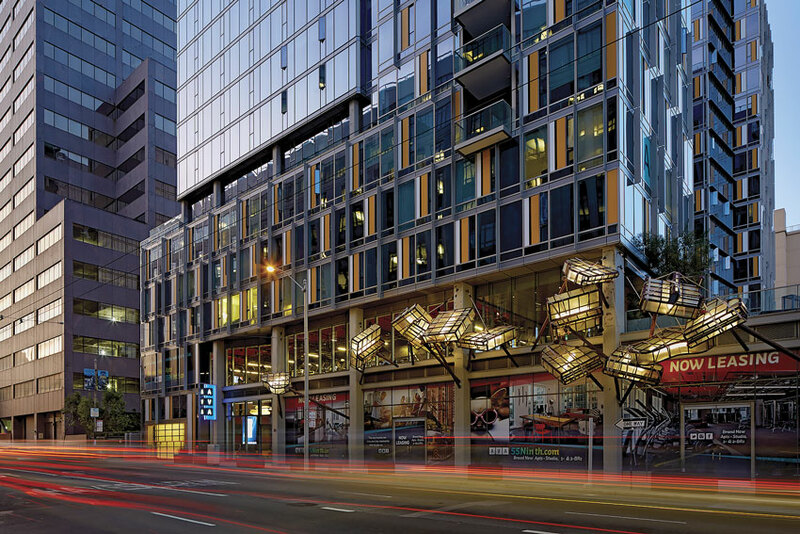 In 2013, AvalonBay announced it would take a more comprehensive approach to “environmentally sustainable development.” Among its initiatives: providing tenants with energy labels for their apartments and energy-usage benchmarking in 48 of its communities “to enable more proactive decisions about building performance and maintenance needs,” according to an announcement. As of March 31, 2015, AvalonBay owned or held a direct or indirect ownership interest in 279 apartment communities, containing more than 81,600 units in 11 states as well as the District of Columbia. Solar System: The ACCO team also liked the way tankless would work with another of the building’s innovative, green features: a solar hydrothermal pre-heating system, installed to enable the structure to meet California's stringent Building Energy Efficiency Standards (Title 24). By trimming the energy draw of the tankless water heaters, “the solar pre-heating system reduces the building’s overall energy consumption,” explains Joyce. Thirty-eight rooftop solar panels use a glycol-and-water mixture to collect and transfer heat to a 2,250-gallon basin, a closed system filled with water and located inside the mechanical room. A second, pumped loop transfers the heat in the basin water to the water entering the 18 tankless units nearby. As a consequence, the incoming water temperature is approximately 20 degrees warmer than it would be if it came straight from the ground. Redundancy: An apartment complex the size of AVA 55 Ninth typically uses hot water much like a large hotel: peak demand, or close to it, first thing in the morning, as tenants prepare for their day; low-level usage throughout the day while most tenants are away; a second, smaller spike in the evening when tenants return to do food preparation, dish washing, bathing, etc. That ever-fluctuating demand is why 18 heaters were used: Such a large number of units permit a more precise response to the hot-water usage habits of 273 different tenants. When all 18 are fully operational, total consumption is 199,900 BTU/HR x 18, or 3,598,200 BTU/HR. Total flow rate: 104.6 gallons per minute. Of course, actual demand is usually well short of that maximum, and sometimes (the middle of the night) there is comparatively little demand at all. But when a tenant does turn on a tap, shower or washing machine, she expects the hot water to flow all but instantaneously. The AVA 55 Ninth system responds to that right-now need by having at least one tankless unit operating at all times, keeping water at a minimum temperature constantly circulating to all 273 units. As demand grows, the other 17 heaters fire in whatever sequence is required to meet it. Each NCC1991 has a minimum consumption of 16,000 BTU/HR. That calculates into a turndown ratio of 225 to 1 (3,598,200 divided by 16,000). The higher the ratio, the greater the capability of a system to adjust to the wide-ranging demand of a large, multi-family community. Meanwhile, the solar thermal setup allows this always-on system to still function efficiently by minimizing the energy needed to raise the temperature of water coming into the heaters. And absent any storage tank, there is no wasted energy beyond the heat lost through the building’s supply piping, as the water circulates through it. One additional benefit of this redundancy cannot be overestimated. If any heater in the system needs maintenance, the other 17 will combine to pick up the slack. Except for absolute, peak-demand conditions, tenants should be unaware that any servicing is happening, let alone experience an interruption in the flow. Round-the-clock reliability is designed right into the system. 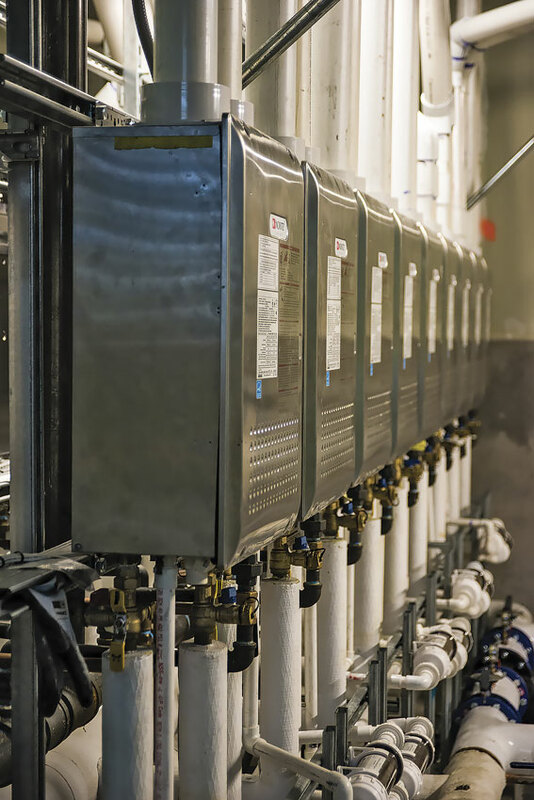 Whatever concerns AvalonBay and ACCO had initially regarding the ability of a tankless system to meet the considerable hot water needs of AVA 55 Ninth, the system sizing and design phase answered them to everyone’s satisfaction. Tankless also provided another key cost-cut: because of their comparative small size and weight, there was no need for a crane for placing the water heaters on the roof. The units were simply delivered to the building’s parking garage and then taken up on the service lift. 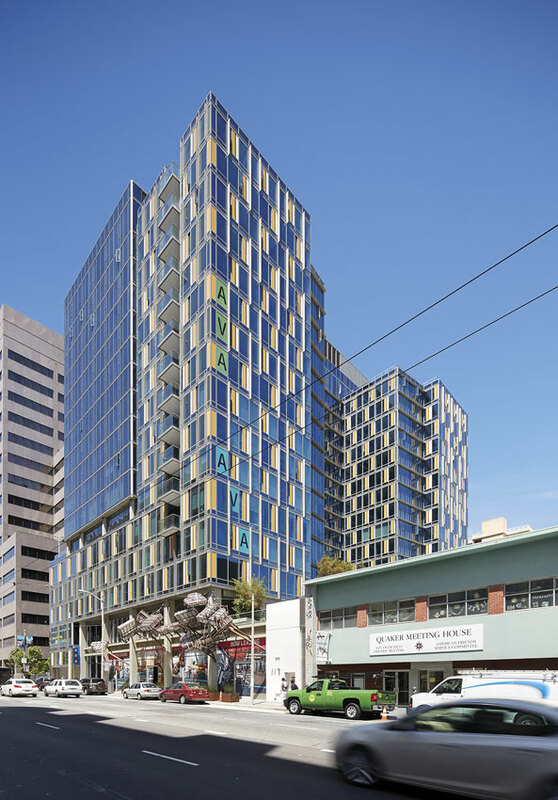 “Eliminating the need for a crane was a major savings,” says Hunt, “and we didn’t have to worry about scheduling its use, either” – usually a major hassle on an urban job site because there’s so little room for staging deliveries. 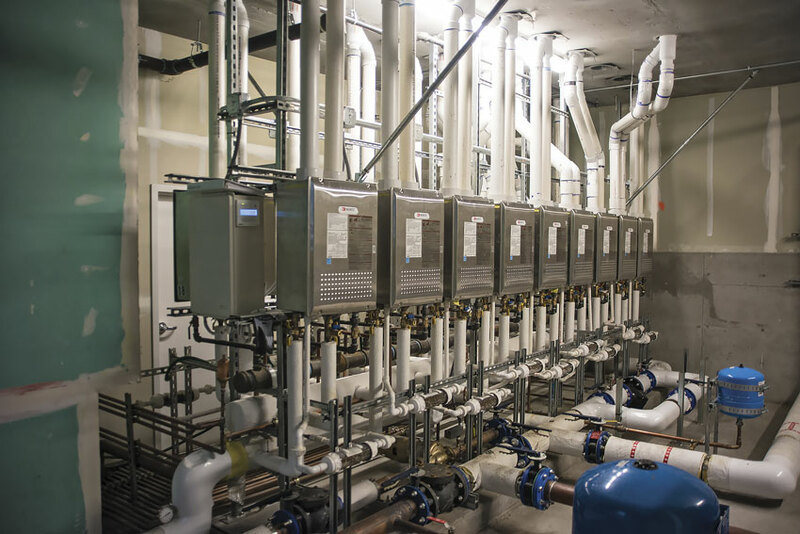 From design to delivery to installation, to its subsequent performance for the tenants of this property, the tankless DHW system has proven to be a solid choice for AVA 55 Ninth, as well as for a growing number of commercial and multifamily projects. JASON FLEMING serves as marketing and customer care manager for Noritz America, based at company headquarters in Fountain Valley, Calif. He can be reached at: (714) 433-2905 ext. 7813. To download a hi-res image file, click on the desired thumbnail and enter a gallery of images with captions and link to a zip archive. Clicking on the link automatically downloads the zip archive to your computer. Due to how various browers handle downloads, you may have to expand the zip archive manually. Images are 6" x 4" (1800 x 1200 pixels) x 300 ppi; CMYK; unless otherwise specified. Other sizes may be available upon request.